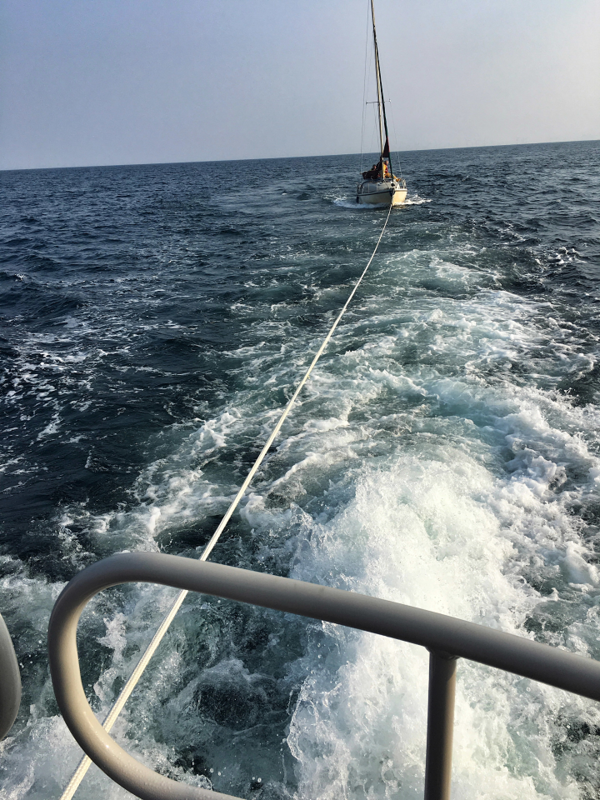 Concern was being shown on Saturday afternoon (4th June) for a 21 foot (7 metre) yacht which was overdue while on passage from Douglas on the Isle of Man to Lytham with one person on board. The vessel had been sailing in company with a number of other yachts but part way through the passage from the Island contact was lost in misty conditions. The other boats of the flotilla arrived safely off the mouth of the Ribble but with no sign of their companion. After waiting for a time for the boat to arrive, the Holyhead Coastguard was informed. In case the yacht had arrived unseen, Coastguard Teams first checked the local berths at Lytham and Freckleton and other ports and harbours but without success. With calm conditions but little wind to power the overdue yacht, Holyhead Coastguard became increasingly concerned as no contact could be made with the owner, no communication equipment being carried on board the vessel. The volunteer crew of the Lytham St Annes Lifeboat Station were paged at 3.09pm. The Lytham St Annes inshore lifeboat (ILB) Sallywas launched from Seafield Road and headed out to the mouth of the river to check if two yachts anchored there waiting for the next high tide, had any information about the missing boat. At the same time the station’s Mersey class all-weather lifeboat (ALB) Her Majesty the Queen was brought out of her Boathouse to the top of the slipway in readiness. 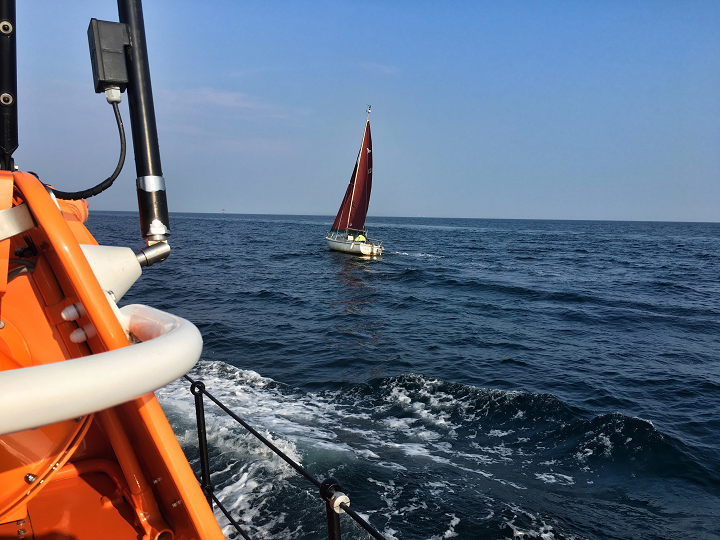 With no further information obtained from the anchored yachts the lifeboat (ALB) set out at 3.23pm to search the Irish Sea while the ILB returned to her boathouse. The lifeboat was launched west of the pier with Coxswain Gary Bird in command and headed out to begin the search. With many square miles of the Irish Sea to search as the missing vessel could have been anywhere between The Isle of Man and the Lancashire coast, Holyhead Coastguard also tasked one of their helicopters and the Tyne class lifeboats from Fleetwood and Douglas to join in the search. The helicopter found the vessel shortly after 4.30pm to the south of the Ribble and in the misty conditions heading towards Formby and the Mersey, missing the Ribble entrance by a considerable distance. Once it was confirmed that this was indeed the casualty Lytham Lifeboat was asked to bring the vessel home and the other two lifeboats and helicopter were released to return to their stations. Arriving alongside the yacht after half an hour, lifeboat crewman Vinny Pedley leapt aboard to assist the owner and a tow rope was connected before the long, slow return to the Ribble began. The lifeboat arrived off Lytham around 9pm and handed the yacht over to the re-launched ILB to tow the last mile to the yacht’s berth in Lytham Dock. The lifeboat was recovered and returned to her boathouse at 10.15 after nearly 7 hours at sea while the ILB, after safely mooring up the yacht at Lytham Dock, returned to her boathouse shortly after. Both lifeboats were then refuelled and cleaned before the volunteer crew could return to their homes.